An electrolyte is a substance that produces an electrically conducting solution when dissolved in a polar solvent, such as water. The dissolved electrolyte separates into cations and anions, which disperse uniformly through the solvent. Electrically, such a solution is neutral. If an electric potential is applied to such a solution, the cations of the solution are drawn to the electrode that has an abundance of electrons, while the anions are drawn to the electrode that has a deficit of electrons. The movement of anions and cations in opposite directions within the solution amounts to a current. This includes most soluble salts, acids, and bases. Some gases, such as hydrogen chloride, under conditions of high temperature or low pressure can also function as electrolytes. Electrolyte solutions can also result from the dissolution of some biological (e.g., DNA, polypeptides) and synthetic polymers (e.g., polystyrene sulfonate), termed "polyelectrolytes", which contain charged functional groups. A substance that dissociates into ions in solution acquires the capacity to conduct electricity. Sodium, potassium, chloride, calcium, magnesium, and phosphate are examples of electrolytes. In medicine, electrolyte replacement is needed when a person has prolonged vomiting or diarrhea, and as a response to strenuous athletic activity. Commercial electrolyte solutions are available, particularly for sick children (such as oral rehydration solution, Suero Oral, or Pedialyte) and athletes (sports drinks). Electrolyte monitoring is important in the treatment of anorexia and bulimia. Svante Arrhenius put forth, in his 1884 dissertation, his explanation of the fact that solid crystalline salts disassociate into paired charged particles when dissolved, for which he won the 1903 Nobel Prize in Chemistry. Arrhenius's explanation was that in forming a solution, the salt dissociates into charged particles, to which Michael Faraday had given the name "ions" many years earlier. Faraday's belief had been that ions were produced in the process of electrolysis. Arrhenius proposed that, even in the absence of an electric current, solutions of salts contained ions. He thus proposed that chemical reactions in solution were reactions between ions. It is also possible for substances to react with water, producing ions. For example, carbon dioxide gas dissolves in water to produce a solution that contains hydronium, carbonate, and hydrogen carbonate ions. 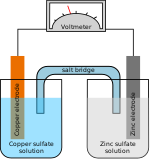 Molten salts can also be electrolytes as, for example, when sodium chloride is molten, the liquid conducts electricity. In particular, ionic liquids, which are molten salts with melting points below 100 °C, are a type of highly conductive non-aqueous electrolytes and thus have found more and more applications in fuel cells and batteries. In physiology, the primary ions of electrolytes are sodium (Na+), potassium (K+), calcium (Ca2+), magnesium (Mg2+), chloride (Cl−), hydrogen phosphate (HPO42−), and hydrogen carbonate (HCO3−). The electric charge symbols of plus (+) and minus (−) indicate that the substance is ionic in nature and has an imbalanced distribution of electrons, the result of chemical dissociation. Sodium is the main electrolyte found in extracellular fluid and potassium is the main intracellular electrolyte; both are involved in fluid balance and blood pressure control. All known higher lifeforms require a subtle and complex electrolyte balance between the intracellular and extracellular environments. In particular, the maintenance of precise osmotic gradients of electrolytes is important. Such gradients affect and regulate the hydration of the body as well as blood pH, and are critical for nerve and muscle function. Various mechanisms exist in living species that keep the concentrations of different electrolytes under tight control. Both muscle tissue and neurons are considered electric tissues of the body. Muscles and neurons are activated by electrolyte activity between the extracellular fluid or interstitial fluid, and intracellular fluid. Electrolytes may enter or leave the cell membrane through specialized protein structures embedded in the plasma membrane called "ion channels". For example, muscle contraction is dependent upon the presence of calcium (Ca2+), sodium (Na+), and potassium (K+). Without sufficient levels of these key electrolytes, muscle weakness or severe muscle contractions may occur. Electrolyte balance is maintained by oral, or in emergencies, intravenous (IV) intake of electrolyte-containing substances, and is regulated by hormones, in general with the kidneys flushing out excess levels. In humans, electrolyte homeostasis is regulated by hormones such as antidiuretic hormones, aldosterone and parathyroid hormones. Serious electrolyte disturbances, such as dehydration and overhydration, may lead to cardiac and neurological complications and, unless they are rapidly resolved, will result in a medical emergency. Measurement of electrolytes is a commonly performed diagnostic procedure, performed via blood testing with ion-selective electrodes or urinalysis by medical technologists. The interpretation of these values is somewhat meaningless without analysis of the clinical history and is often impossible without parallel measurements of renal function. The electrolytes measured most often are sodium and potassium. Chloride levels are rarely measured except for arterial blood gas interpretations, since they are inherently linked to sodium levels. One important test conducted on urine is the specific gravity test to determine the occurrence of an electrolyte imbalance. In oral rehydration therapy, electrolyte drinks containing sodium and potassium salts replenish the body's water and electrolyte concentrations after dehydration caused by exercise, excessive alcohol consumption, diaphoresis (heavy sweating), diarrhea, vomiting, intoxication or starvation. Athletes exercising in extreme conditions (for three or more hours continuously, e.g. a marathon or triathlon) who do not consume electrolytes risk dehydration (or hyponatremia). A home-made electrolyte drink can be made by using water, sugar and salt in precise proportions. Commercial preparations are also available for both human and veterinary use. Electrolytes are commonly found in fruit juices, sports drinks, milk, nuts, and many fruits and vegetables (whole or in juice form) (e.g., potatoes, avocados). In some fuel cells, a solid electrolyte or proton conductor connects the plates electrically while keeping the hydrogen and oxygen fuel gases separated. In electrolytic capacitors the chemical effect is used to produce an extremely thin dielectric or insulating coating, while the electrolyte layer behaves as one capacitor plate. Gel electrolytes - closely resemble liquid electrolytes. In essence, they are liquids in a flexible lattice framework. Various additives are often applied to increase the conductivity of such systems. Dry polymer electrolytes - differ from liquid and gel electrolytes in the sense that salt is dissolved directly into the solid medium. Usually it is a relatively high dielectric constant polymer (PEO, PMMA, PAN, polyphosphazenes, siloxanes, etc.) and a salt with low lattice energy. In order to increase the mechanical strength and conductivity of such electrolytes, very often composites are used, and inert ceramic phase is introduced. There are two major classes of such electrolytes: polymer-in-ceramic, and ceramic-in-polymer. Organic ionic plastic crystals - are a type organic salts exhibiting mesophases (i.e. a state of matter intermediate between liquid and solid), in which mobile ions are orientationally or rotationally disordered while their centers are located at the ordered sites in the crystal structure. They have various forms of disorder due to one or more solid–solid phase transitions below the melting point and have therefore plastic properties and good mechanical flexibility as well as improved electrode|electrolyte interfacial contact. In particular, protic organic ionic plastic crystals (POIPCs), which are solid protic organic salts formed by proton transfer from a Brønsted acid to a Brønsted base and in essence are protic ionic liquids in the molten state, have found to be promising solid-state proton conductors for fuel cells. Examples include 1,2,4-triazolium perfluorobutanesulfonate and imidazolium methanesulfonate. ^ "The Nobel Prize in Chemistry 1903". Retrieved 5 January 2017. ^ Jiangshui Luo; Jin Hu; Wolfgang Saak; Rüdiger Beckhaus; Gunther Wittstock; Ivo F. J. Vankelecom; Carsten Agert; Olaf Conrad (2011). "Protic ionic liquid and ionic melts prepared from methanesulfonic acid and 1H-1,2,4-triazole as high temperature PEMFC electrolytes". Journal of Materials Chemistry. 21 (28): 10426–10436. doi:10.1039/C0JM04306K. ^ "Rehydration drinks". Webmd.com. 28 April 2008. Retrieved 25 December 2018. ^ "Oral Rehydration Salt Suppliers". Rehydrate.org. 7 October 2014. Retrieved 4 December 2014. ^ a b c d Jiangshui Luo; Annemette H. Jensen; Neil R. Brooks; Jeroen Sniekers; Martin Knipper; David Aili; Qingfeng Li; Bram Vanroy; Michael Wübbenhorst; Feng Yan; Luc Van Meervelt; Zhigang Shao; Jianhua Fang; Zheng-Hong Luo; Dirk E. De Vos; Koen Binnemans; Jan Fransaer (2015). "1,2,4-Triazolium perfluorobutanesulfonate as an archetypal pure protic organic ionic plastic crystal electrolyte for all-solid-state fuel cells". Energy & Environmental Science. 8 (4): 1276–1291. doi:10.1039/C4EE02280G. ^ "The Roll-to-Roll Battery Revolution". Ev World. Retrieved 20 August 2010. ^ Jiangshui Luo; Olaf Conrad; Ivo F. J. Vankelecom (2013). "Imidazolium methanesulfonate as a high temperature proton conductor". Journal of Materials Chemistry A. 1 (6): 2238–2247. doi:10.1039/C2TA00713D.